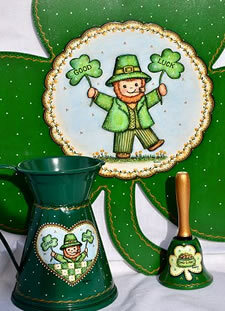 Featuring a dancing leprechaun on a cut-out shamrock that also could be painted on a round plate or other surface. This packet also includes a small pitcher with a leprechaun painted on one side and a little bear painted on the other side and a small wooden bell with a pot of gold painted inside a shamrock. This packet contains: Complete directions, five color photos and one full size pattern page.